You are here because you want to have the laminate floor in you place. This kind of floor was not the best of the best reputation floor covering. From the other hand, it is easy to lay and looks very attractive. So, what are the pros and cons of laminate flooring? Laminated floor is easy to lay out. Everyone knows that. It is really fast. You can lay the area of 300 square feet for one weekend. Of course, the old types of laminated materials needed to be fixed with one another with the help of glue. Everything is different now. Today, the laminated floor designed in special way to lay it with no glue. It is like doing puzzle. It is very easy as the boards are made of soft wood. Of course, modern laminate makes it easy to lay. If you buy the materials of low quality, the laminated locks do not work in proper way. It makes the floor hurtable to water and heavy weight influence. The laminated floor is very easy to clean. Just use mop or wet dust to wash it and dry. It needs no wax. Heavy water penetrates the locks of the laminate to damage it. So, laminated floor needs no water but special cleaning shampoo. Laminate flooring is good to lay in the dry environment. It is also attractive for using it in such wet rooms as kitchen, corridor, hall. As far as your floor is fixed in proper way, the locks are reliable protection from moisture. Nevertheless, laminated floor does not like slack water. It can happen in kitchen, bathroom, anywhere. Pay attention that it is better to use ceramic or vinyl piles for rooms of such a type. 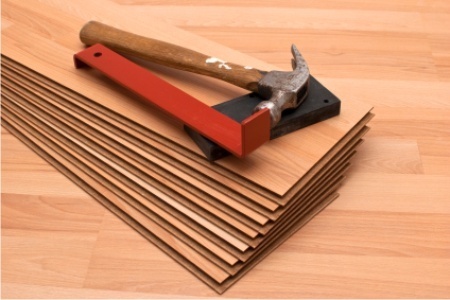 Unlike wooden floor, laminated covering is difficult to hurt or crack. The upper layer is very hard. It is protective for spots, watering, and mechanic damages. Never be afraid to damage your floor with the dirty spots and stains. They are easy to clean. If the laminated floor is damaged with one or another way, cracked or spoiled, you cannot repair it but replace. As far as laminated floor has covering layer, it is hard and multifunctional. It helps you to use floor and feel comfortable at that. It is not slippery in the bathroom and at the fire place. Traditionally, laminated floor is slippery. This problem must be fixed with the latest time. The laminated floor looks like the natural wooden cover. The choice is wide. You may choose the laminated boards with interesting even exotic designs. If you lay laminated floor incorrectly, the cover design looks strange. Maybe have you your own opinion as for above pros and cons of laminate flooring? Of course there are many pros and cons of laminate flooring, but more and more people like it. Why? It is real to finish the room in a day. As it was said before, laminated floor is like a puzzle. You should fix one piece to another with the help of special locks. It is very important to use no glue or other liquids for montage. The laminated boards are light and soft to cut according to your needs with the help of special knife. 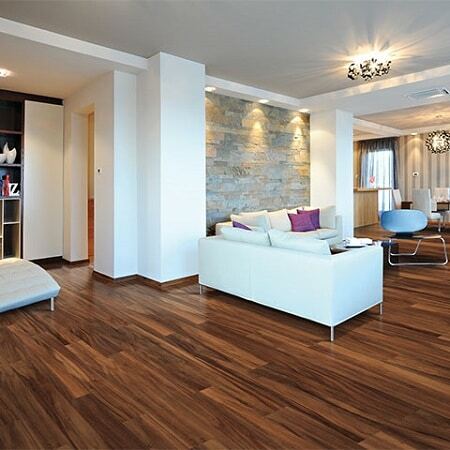 Of course, comparing laminated floor with other kinds of flooring, this is the most attractive one for do-it-yourself. If you know a little about flooring types and montage, you can lay in your room. The main thing is making the under floor level straight. You will not meet other difficulties. Of course, this is not the main laminate characteristic. Nevertheless, you can lay your laminate flooring of below ground level if you need it. Never forget about the vapor-proof barrier. It is better not to laminate floor in the places of high moisture like bathroom or toilet, washing room. You may easily use laminated covering for kitchen, hall. NALFA (North American Association of Laminated Floors) is a company that is responsible for laminated floor quality. They check the floor from different producers. You may easily lay the floor and – demount it. All you need is demounting skirtboards and take your floor into pieces as a big puzzle picture. It is very convenient and very fast if you want to replace the floor pieces or renew it. You think that laminated cover is damaged and too soft to use it for your floor. You are wrong. Never forget that even wooden floor has big problems. So, the laminated boards are as good and reliable as hardwood boards as they are made of pressed materials like a big layered pie. So, you can crack hardwood flooring and ceramic pile easily. The engineering wooden boards are solid and stable but not good in use. All kinds of floor have its advantages and disadvantages. Choose what you like. The laminated floor must be smooth and solid if it is done correctly. The easiest way to clean this kind of floor is Swiffer Wet Jet. You may use wet mop or dry cleaning, as you wish. Never forget that laminated floor does not like water. The laminated floor is good in design. You may find the floor of different designs to look like different materials: wood, stone, ceramics, something exotic. The boards are different colors that makes laminated floor very attractive to use for different interiors. What kind of wood do you prefer? You may choose cherry tree, oak tree or birch or instead choose the floor that looks like the redwood. More sizes available: the standard laminated size is 3.5″. You may find 7 3/4 “. Want more proves? Pressing is the best technology to produce high quality floor for everyday use. The pros and cons of laminate flooring are different for different users. Why do you need to lay the floor of this type? Share you information, please.